It's not just a bread box; it's a once-in-a-lifetime investment you won't find in a department store anywhere! Made by Amish woodworkers just down the road from our Kidron, Ohio store, this is a true heirloom that will grace your kitchen for many years to come. We've owned/used our oak breadbox for several years now. It is wonderful! Craftsmanship is excellent and the materials will last a lifetime. It sill looks as good as it did when new. We don't use it for bread - we have another use for it and it works really well. And looks great! We feel that this bread box is well worth the money we spent on it. First off, this bread box is pricey. However, you get what you pay for since it is hand made in USA as opposed to some mass produced import that might last a couple of years. The action on the roll top is smooth and even. The bread compartment easily stores 3 loaves of bread. The top drawer for bagels or English muffins is a nice addition too. Overall, the bread box is very well designed and constructed. It is beautiful and is heirloom quality. Great bread box made in USA! This is a large bread box that is very well made. The light oak color matches my cabinets so it looks great. Even though it is expensive, it is worth it. Also, I was happy to see that it is made in the USA. I was so excited when my breadbox arrived. I have wanted this kind of breadbox for a long time. It is very well made, it is sturdy. Fits right in with my oak cabinets and my sellers cabinet which also has a rook top. I was given this breadbox by my husband for my birthday. What a beautiful and thoughtful gift! The quality, craftsmanship, and attention to detail that was put into this beautiful piece is inspiring. The money was well spent, and I am proud to know that this purchase also supports a product made in America. Many thanks to Leah whose attention to packing and detail insured that this breadbox arrived without a scratch when shipped from Ohio to Louisiana. Thank you for a quality product that will be a family heirloom! BEE-YOU-TEA-FULL!!! This bread box is heirloom quality! Finely crafted! Those Amish folks really know how to work with wood! It is quite large, so yes, it does take up lots of counter space, but I have both the drawer and the bottom compartment full of bread and snack products, so it really is a useful and special addition to my kitchen counter! What a beautiful item! I received it as a gift from my mother. At first I thought it was rather large, but we found the perfect place for it. I would suggest trying it in different parts of your kitchen until you find the exact perfect spot. I can tell that it is extremely well-made and it is definitely an heirloom I will pass on to my daughter. The young lady that I talked with when ordering the item said that it would take 7-10 days to receive. She was right on the button with her estimate. The breadbox was packed exceptionally well and had no damage. The look was everything I had hoped for and the workmanship was wonderful. the drawer was easy to open and close and the door to the bread area fits nicely and is easy to open and close. Very high quality construction. Bought for wife Christmas and she loves it. Only problem is finding the right spot to put it as it does take up considerable counter space, I do not think she has found the best place for it yet. We love this bread box! It is large enough for several loaves of bread and it looks so good alongside our wooden kitchen cabinets. It may seem a little pricey, but when you consider that you will use it every day and how long it will last, you might even consider it a bargain. Highly recommended. Its a good amount of money for a bread box but this one is worth it. Extremely well made, very roomy yet takes up little counterspace, and naturally attractive real wood. How they used to make things and still do I guess at Lehman's. I love this bread box! It is so well made I'm sure it will become an heirloom. 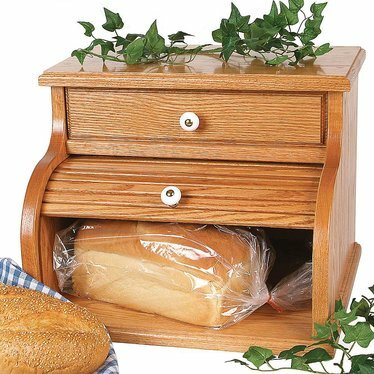 It holds several loaves of bread easily and the drawer is great. I love to be able to use the top for other small items. The white creamic knobs are very nice and add a nostalgic look. Do be sure you have the space and you will be very happy with this bread box. We are delighted with our bread box. It is capacious, handsome, and works beautifully. It also matches our cabinets. Good strong quality product. Looks great on my countertop. Plenty of room inside for a few loaves of bread and other things. This is a quality item of great beauty and function. I love it! This is an excellent product-well built, attractive and just what we wanted. The first bread box I received was irregular and defective. Lehman's was very apologetic and sent a replacement immediatly. The replacement is excellent,beautiful and the door operates very smoothly. We use the small drawer for granola bars and other small items. The main compartment is very roomy. It can hold several loaves of bread with room to spare. It is large though, measure to make sure you have the counter space.